Engaging cohort learning for math educators | Clarity Innovations, Inc. Taking the professional learning community to the next level, allowing instructional coaches to foster, support, and enrich educators’ understanding of mathematical strategies. New Perspectives Online is a different kind of professional learning platform. 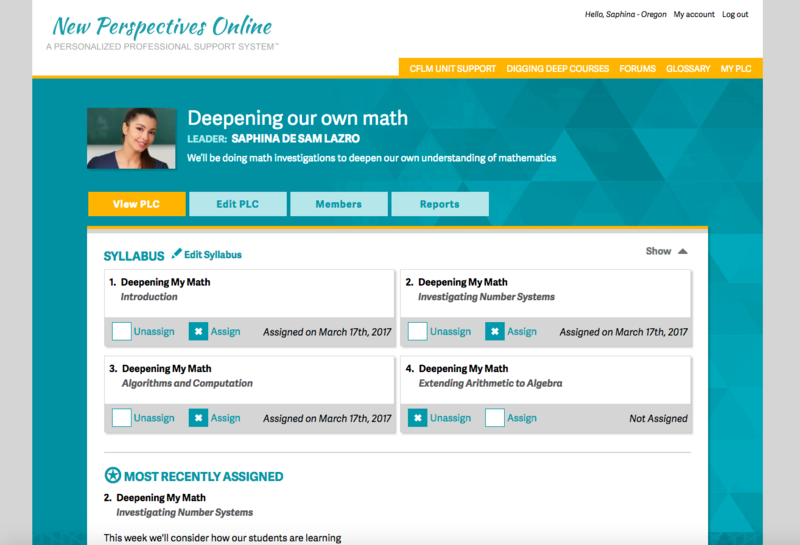 Launched in 2015, the online platform supports the well-respected Contexts for Learning Mathematics curriculum, created by Cathy Fosnot and Maarten Dolk. Their work over the past 20 years has transformed the way mathematics is taught and learned in the US, and around the world. Now they're changing how educators improve their professional practice online with online cohort-based learning. Cathy and Maarten wanted to find a way to provide 24/7 support and peer to peer learning, so educators could construct their own path to improving their understanding and instruction of mathematics. While online professional learning communities have demonstrated their value for ad hoc informal learning, most lack adequate functionality to be organized and led in a meaningful way, whether by an instructional coach, content specialist, master teacher, school administrator, or college/university faculty. Building on the online platform we developed for them previously, we expanded its functionality to allow schools or whole districts to create and manage online learning cohorts where educators could work together, share insights, and seek guidance and feedback from leading math coaches and curriculum specialists. The online cohort functionality supports creating individualized learning pathways through the growing collection of online content about the Contexts for Learning Mathematics curriculum, including new supplemental units published by Cathy and Maarten. What's more, the solution can track progress by assignment or by participant, allowing cohort leaders the ability to personalize the support provided to educators.